U.S. Rifle, Caliber .30, M1 - The M1 is commonly called the "Garand" after it's inventor, John Garand. The M1 was the standard infantry rifle of World War II. Each member is expected to acquire an M1 Garand. The M1 is loaded with an 8-round "en bloc" clip, shown above just below the rifle. The leather sling was standard issue, but eventually was replaced by a khaki/green web sling. The M1 shown above does not have the blank adapter attached, and does not have the "locking bar" rear sight commonly associated with WWII Garands, but is fairly typical of those M-1s currently available. Carbine, Caliber .30, M1 - The M1 carbine was originally intended as a replacement for the pistol normally carried by soliders such as drivers, radiomen, officers, etc. In practice, many soldiers wanted a carbine because of its small size and light weight. Although listed as .30 caliber, the M1 carbine round is nothing like the M1 Garand round, and in fact is little more than a high-powered pistol cartridge. The carbine pictured has the WWII style rear sight, stock and "2 rivet" handguard. The carbine must be blank adapted internally which ruins its collector value. 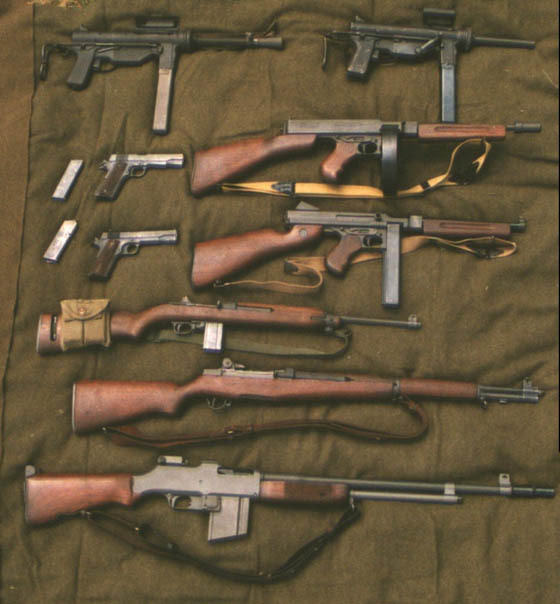 WWII carbines did not have the bayonet lug attached. Also shown are the standard 15 round magazines and ammo pouches. The magazines at the left are still in their protective paper covering. Also note the standard-issue khaki web sling. 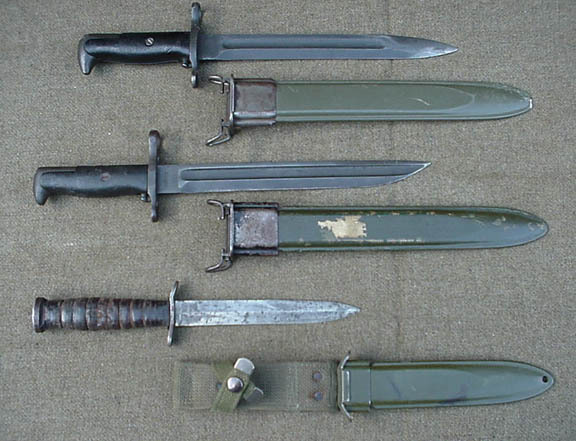 Bayonets and Fighting Knife - Top: M1 Bayonet. Standard issue, with 10-inch blade and fiberglass and metal scabbard. Center: M1905E1 Bayonet. Officially, this bayonet was also designated as the M1 bayonet. Commonly referred to as a "cut-down" M1 bayonet. These were made from 16-inch M1905 bayonets when production could not meet the demand for M1 bayonets. Shown is the "Bowie" tip. Also made was a spear-point tip like the M1 bayonet at top. Bottom: M3 fighting knife with M8 scabbard. The M3 was issued to personnel who were not issued an M1. In practice, it was used by anyone who could get one, and was very popular. M1911A1 Caliber .45 Pistol - Commonly called the ".45 auto" or ".45." Although often called an "auto," the pistol is actually semi-automatic. The magazine holds 7 rounds. Typically issued to officers, drivers, tank crews, etc. Shown with the M1916 holster. 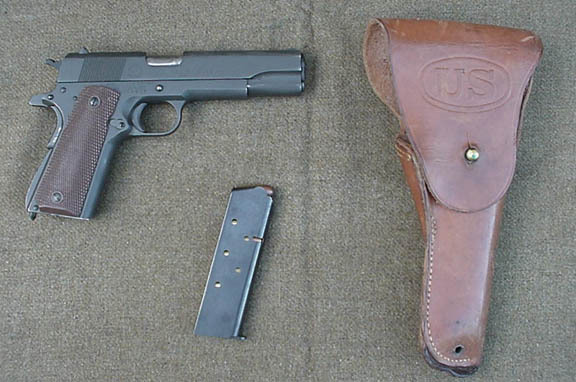 The pistol shown is actually a modern M19111A1 produced by Springfield Armory, but other than the markings, it is functionally and visually identical to WWII M1911A1s. M1918A2 Browning Automatic Rifle - Commonly called the "B.A.R." Fires the same .30-06 cartridge as the M1 Garand. This was the squad's automatic weapon and was highly favored by the troops, except for it's weight which was around 20 pounds. The bipod was often removed in an attempt to save weight. (Weapon shown is a modern-made semi-auto only version, but is externally identical to the weapon used in WWII). M3A1 Submachinegun, Caliber .45 - The M3, commonly called the "Grease Gun," was an attempt to produce a cheapier, easier to manufacture replacement for the Thompson. Compared to the Thompson, the Grease Gun loks and feels cheap, and was not especially well-liked by the troops. The M3 was further simplified and issued as the M3A1 shown above. Despite it's problems, this weapon continued in use by the US Army into the 1990s. M1919A4 Machine Gun, Caliber .30 - Another one of John Browning's designs, the M1919 series of machine guns were derived from the M1917 series and were simple, robust, and reliable. The rate of fire was slower than many soldiers would have preferred, and it lacked a quick-change barrel. M2 Machine Gun, Caliber .50 - Yet another John Browning design, the M2 "fifty-cal" was a scaled up version of the M1919 series with some additions such as a hydraulic buffer. The .50 caliber round was a scaled-up .30-'06 round. This weapon was first adopted by the U.S. Army at the end of WWI, but never saw action. This machine gun is also simple, robust and reliable and remains in the U.S. military inventory to this day. For more information, click HERE. Launcher, Rocket, Antitank, M1 - Better known as the "Bazooka." This early model bazooka fired a 2.36-inch rocket. It was slightly modified and renumbered the M1A1. It was eventually replaced by the M9A1 which featured a tube that could be folded in half for ease of transport and storage. The M9A1 was replaced shortly after the end of the war by the M20, which fired a 3.5-inch rockt. No M20s saw service in WWII. Acknowledgements: Black and white photos of the M3A1 Grease Gun, M1919A4 Machine Gun, M2 Machine Gun, and M1 Bazooka are from the book "U.S. Infantry Weapons of World War II" by Bruce N. Canfield.